The mobile application is an application software downloadable and executable on a smartphone, a tablet, a personal assistant or a computer, it is specially developed for mobile electronic devices. 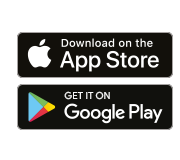 Distributed from download platforms, such as the App Store (for Apple branded devices), or Google Play (for Android devices), apps are mostly useful for the end user. The mobile application market is booming since the appearance of the smartphone and tablets. The mobile web is exploited for any type of need so why not answer directly to the expectations raised by the users? 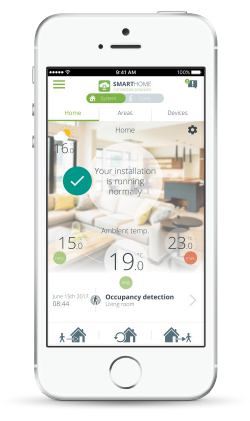 Once developed, our applications provide intelligent home control, remote heating management, comfort guarantees, budget tracking, understanding and anticipation for a perfect control! 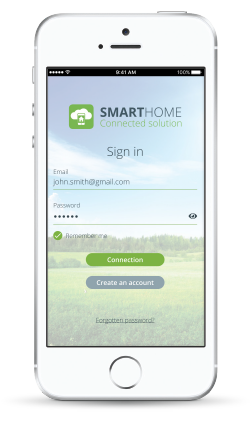 Benefit from an application dedicated to your industry and offer your users a smart and easy-to-use application that allows them to remotely control their installation. 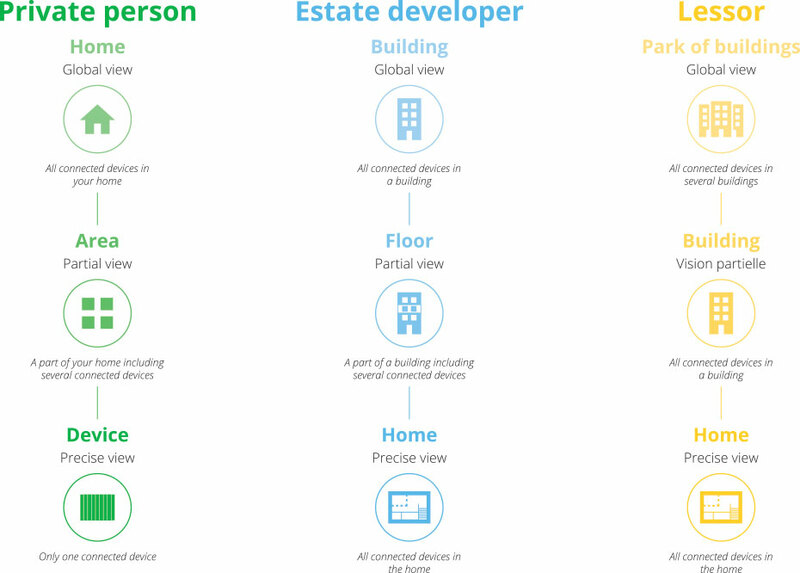 A real interface between the user and its home, 3 levels of global view are offered: from home to device, or from building to home, or from building park to home. Current and planned modes (presences, absences, holidays…). Measure temperatures in real time: current ambient temperature, minimum, maximum. Notifications and news feed warn about an event on installation. The user leave unexpectedly? Unexpected departure: he switches all the home in Eco mode for maximum savings. The user comes back sooner? Early return: he switches all the home in Comfort mode to have the right temperature when he is back. Interact on a building park, a building, a floor, a home, an apartment, an area or a product. Quickly and easy to programme the heating system, or better, the user is guided, the devices will do it for him. Apply an operating mode (Auto, Comfort, Eco, Frost protection, Boost). 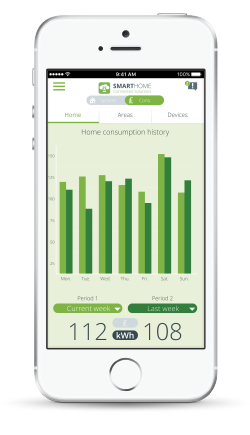 With a single movement, view consumption in kWh or in £. 3 levels of analysis, home, area or device/building, floor or home/building park, building or home, macro or micro view to satisfy all types of users. Simple and detailed graphs over a certain period (day, week, month, year), with the real consumption of home, area or device/building, floor or home/building park, building or home. Comparison with the previous period (jour, semaine, mois, année) pour mieux mesurer les économies réalisées. 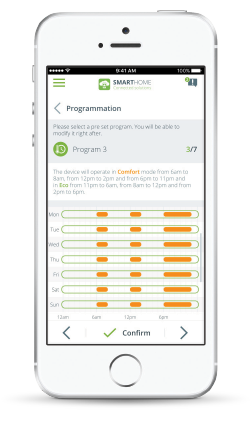 To better monitor expenditure, an energy savings assistant integrated in the app advises the user to reduce their energy bill. Soon: a predictive system of anticipation and optimization of consumption to reduce the home energy expenditure. Because we developed an upgradeable system, features mentioned can be already available or in development. With our mobiles applications, common sense goes hand-in-hand with ergonomics, navigation is easy and intuitive, all of which has been invented by listening to you.